A coming of age story of a young wannabe high society “gentleman,” mentored by an older gentleman whose “been there.” Sounds like a film we’ve seen before. But I assure you, ‘The Extra Man,’ is much more fun, and a fresh take on an old theme, and executed with excellence. Directed by the husband-and-wife team of ‘American Splendor,’ Robert Pulcini and Sharin Springer Berman adapted ‘The Extra Man,’ from Jonathan Ames’ novel. He answers a listing for a room and meets Henry (Kevin Kline), a strange, eccentric writer who lives his life quite peculiarly. His apartment is quite the sight, antique furniture coupled with lawn chars, and bowls filled with christmas ornaments. But, fascinated by Henry, Louis agrees to move in. Henry is quick to begin to teach Louis how to have a glorious social life in New York, by becoming the ‘extra man’ to aging billionaire widows. The hilarious fact is, despite is age and the way he presents himself, Henry is no more high society then Louis. Henry doesn’t see himself for what he is, a very skillful moocher. Using these older women for fine dinners, parties, and rooms in their Palm Beach summer homes. The plot thickens, when Louis realizes that he fantasizes about two very different lives, a member of high society, and dressing like a woman. He also has a crush on his coworker Mary (Katie Holmes), but, his shy awkwardness prevents this from going anywhere. The film could have very easily been pretentious and annoying, but the humor and characters are so self-depricating you can’t help but laugh. The film is filled with hilarious moments, and Kline fills the shoes of Henry so well, you almost forget he’s acting. As I mentioned earlier about Henry’s apartment, the films production design, as well as their wardrobe fit the characters flawlessly. The film also has John C. Reilly as a strange neighbor with a curious voice (you have to see it, I’d hate to ruin that), and he steals the scenes he’s in. Holmes, plays her part of the dizzy uninterested girl extremely well. But at the end of the day, this is Kline and Dano’s movie, and they own it well. 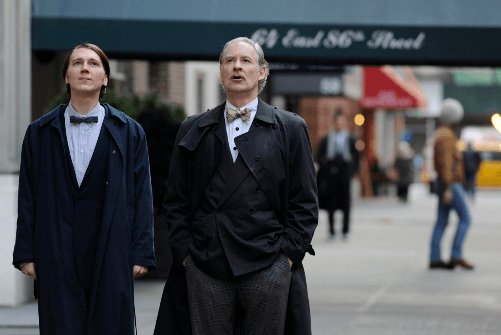 ‘Extra Man,’ is a smart and funny film, and I think the directing hands of Berman and Pulcini combined with the skill, presence, and comic timing of Kevin Kline make this a film you should check out.